Wanted! Technical Coach for Italy! 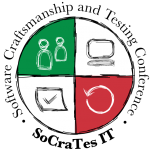 Senior Agile Coach for Italy and Junior Agile Coach for Italy and / or Germany – get in touch! Connexxo is an agile consulting company based in Munich and Milan. We combine the ideas of software agility and organisational development in order to reach synergies. We help our clients to implement modern ways to develop sound products and organisational processes. In addition to our public courses Certified ScrumMaster and Certified Scrum Product Owner, we offer a wide range of agile-related in-house courses and coaching, mentoring and facilitation services, all in the languages English, German and Italian.